Συντάκτης: dikaiopolis , ημέρα Δευτέρα, 2 Μαρτίου 2015 και ώρα 1:56 μ.μ. The Western MSM have never questioned the ‘received truth’ that Athens understated its liability and obligations for several years following the launch of the euro. But few if any outside observers know the truth behind what happened when Papandreou took over the Premiership in Greece….and for Machiavellian reasons, the debt was suddenly overstated. In October 2009, George Papandreou stepped into what one Athens source has called ‘the shitfilled shoes of Kostas Karamanlis’, and discovered that the two previous administrations had lied about both the size of the National Debt, and the ongoing level of government spending. In Greece, the folks you go to see to find out this kind of stuff hang out in an organisation called ELSTAT – the Hellenic Statistical Authority. Rather like an Olympics Budget, the deficit figure kept rising with each week, as the new government opened more and more worm-cans. First ELSTAT said 7.8%, then 9.8%, then it went to 11%, before finally settling at 13.6%. Only then – some time shortly before Christmas 2009 – did Papandreou talk to Brussels, Paris and Berlin about the possible need for a bailout. 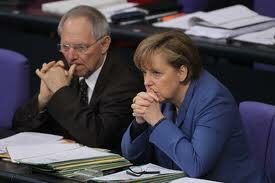 In fact, through her Interior Minister Wolfgang Schäuble, Angela Merkel already know about the Greek deficit lies. Schäuble became Finance Minister shortly after Papandreou came to power. Although Angela Merkel had shafted the wheelchair-bound assassin’s victim on at least two previous occasions, she wanted him now for three reasons: first, as Minister of the Interior, he had an excellent head for secrecy and covert operations. Second, he was hugely in favour of EU political union. And third, he didn’t have the scruples of his SPD predecessor, Peer Steinbrück. A lack of scruple was going to be crucial: for Merkel also knew that German banks were heavily exposed to the Athens deception. Thus, if the eurozone members didn’t put their hands in thir pockets bigtime, Germany could be facing a severe financial crisis. (Sarkozy, says a Parisian diplomatic source, was even more terrified, in that all his exposed banks were completely guaranteed by the State). Somewhere in the midst of these talks, Berlin requested a smaller meeting with the Greeks. At this meeting, three sources (two Greek and one German) allege, the small German delegation made an astonishing observation: the situation would “have to look more desperate” in order to justify a bailout to the other eurozone members. That is to say, only widespread fear of the entire eurozone being damaged would get the member States to pile in with bailout monies. What Berlin was really worried about, of course, was that the Franco-German banking system might collapse if Greece wasn’t saved. And at that stage, little or nothing had been done to make the sector better able to withstand a derivatives wave. The European Commission had in fact already issued a warning in July 2009 that Greece’s deficit was likely to reach 10% of GDP – if no counter-measures were taken to curb public spending – and that Commissioners regarded the official 6% GDP forecast as “over-optimistic”. But, Berlin argued, only something, say, 50% or more above that potential second figure would frighten eurozoners enough to get them to part with their cash. Without assuming much, one has to observe that this plan does have Schäuble written all over it. And sure enough, in due course (November 2010) the eurozone learned that the Greek deficit was ‘currently running at 15.8%’. George Papandreou had meanwhile announced his first austerity package in January 2010, and in May of that year EU leaders unveiled a €110bn bailout with money from the European Union (EU), the European Central Bank (ECB) and the International Monetary Fund (IMF)….the so-called Troika. So clearly, the crisis was real enough….and the bailout fully justified. It seemed. Fast forward now to 2011. 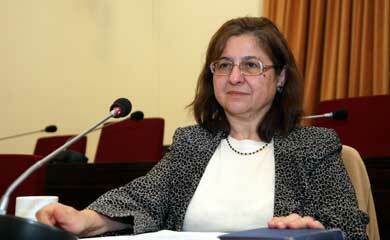 Enter from left field former Hellenic Statistical Authority (ELSTAT) board member Zoi Georganta (pictured) who caused a sensation by alleging that the declared deficit for 2009 had been been massaged upwards in November 2010 by her boss Andreas Georgiou. And lest any nasty male chauvinists out there want to dismiss Zoi Georganta as a lone madwoman, I should point out that six Elstat board members had been dismissed in June 2011 after clashing with Elstat chairman Georgiou. They too had spotted the Tippex liberally applied to the ‘revised’ data. Says one Athenian source, “She was trying to tell everyone forever that she knew Pasok purposely sabotaged Greece at Germany’s request, to ensure our cooperation”. Zoi was off the money with her motive guesswork, but she was in no doubt that the figures had been got at and inflated. Investigators visited her, after which everything died down. It was said that she had changed her statement. But now comes our old friend Evangelo Venizelos – author of the legislation to grant legal indemnity to all Greek Ministers: and in September, he orders the entire ELSTAT board (including Georganta) to resign….except the key villain, Andreas Georgiou. Just fancy that. And when Evangelo gets involved in the mire, you know a sh*tload of mire is being covered over with carefully planted (and watered) roses. But given that Ms Georganta was not the only whistleblower at ELSTAT, the rumour persisted…albeit (as usual) without any awareness of this spreading scandal in the Western MSM. It persisted, in fact, throughout the eurozone. And in March this year, Zoi found an unlikely ally. Joachin Almunia Amann is a former left-wing Spanish politician, and now a prominent European Commissioner. Currently responsible for Competition, in February 2010 – a crucial moment in the debt-inflation plot – he was the European Comissioner for Economic & Monetary affairs…the role now owned by Olli Rehn. Amann was thus in an unparalleled position to watch Greco-EU-German affairs unfold between the austerity announcement and then bailout agreement of 2010. In a letter to the parliamentary committee of inquiry concerning allegations of deliberate deficit inflation of March 2012, Amman crucially stated that, ‘there was no obligation on each national statistical authority in the EU to follow Eurostat’s ESA 95 code on the inclusion of public utility accounts in the deficit’. But for some reason – suddenly – ELSTAT had decided to add it into the pot. In remarking upon this, Joachin defended the six resignees from 2011. (And thus, by implication, Zoi Georganta as well). Highly significantly, Amann also observed that had the 2009 warnings from his Commission been been enacted even as late as Papandreou’s arrival, ‘the measures would have succeeded if they had been properly and promptly implemented without any need for a bailout’. So it was that last Monday (June 25th 2012) Zoi appeared before the deficit Enquiry in Parliament. Having been the unhappy subject of quite a bit of interior ministry ‘attention’ over the last year, Ms Georganta decided to be more circumspect. She dumped on 2009 finance minister Giorgos Papaconstantinou, observing, “I have investigated the matter and found that he does not have any great experience with statistics, with economic issues. In my view, you cannot appoint such an inexperienced minister at such a crucial time.” Unless you don’t want any trouble, in which case you do. But she stuck to her guns about the debt being inflated, telling the Enquiry that the deficit for 2009 should have been 12.5% of GDP – andcould have easily been brought to below 10 percent with immediate measures. Three years ago, I wouldn’t have touched a story like this with a bargepole. But since studying both the EU and the Greek tragedy in more detail in recent times, I’ve realised that a well-documented and sourced account, without collusion and based on trusted informants and mainstream Greek media reports, is more likely to be true than invention. Of course, a great many players on the geopolitical and european stages have agendas, axes to grind, and scores to settle. But when something fits, makes sense, and is in line with other discoveries made along the way….well, all I can say is that absolutely nothing surprises me any more. So the conclusion I draw is that we have here opportunity, motive, testimony, media reports, personal ‘form’ and a jigsaw piece that fits very well with others upon which The Slog has reported over the last two years. In order to illustrate that assertion, let me introduce as a quartet four people I believe to have been pivotal in recent-history world affairs: Tim Geithner, Dominique Strauss-Kahn, Angela Merkel, and George Papandreou. ‘One very important person, I believe, is Strauss-Kahn. His connection with Papandreou is well known, and verified by his interview where he admitted that he had discussions with Papandreou a lot before the Greek door opening to the IMF [in 2010]. The point here is not the connection of S-K with Papandreou, but the timing of the dalliance which he was accused. I believe that S-K was at that point an ally of Merkel. ‘By the end of 2009, the international economic balance seemed to have permanently changed, and a new scene brought to being in which Europe was in a better position than the U.S. At the hub of the wheel there is Germany, asserting the role of economic power model, which could assure international monetary and financial stability. The source is not a million miles away from where I am on this one. That is, DSK was taken out of the game for geopolitical reasons, and replaced with “our gal” (as Geithner calls her) Christine Lagarde. You can read several pieces related to this shift in my dedicated page here, The Strauss-Kahn Waltz. Left without an ally in establishing the hegemony of Europe at America’s expense, both Merkel and Schäuble now became deeply (and rightly) suspicious of the Geithner ‘amputation plot’ hatched in New York between late 2011 and early 2012 by a combo of Wall Street, Pentagon and Fed Treasury appointees. You can read more on this at US Bankers given a timetable for Greek Default and also at Greek default planners falling out over firewall. The Americans hoped to gain a firewall, military bases and access to precious raw materials by befriending a post-euro Greece. That ambition still remains, but what the story unveiled above shows is that Angela Merkel and Wolfgang Schäuble are more than worthy opponents in the murky world of geopolitical jockeying. I would like to thank all the American, French, German, British, Canadian and Greek sources who contributed so generously to helping my feeble brain understand at least some of the above events and allegations. I would also like to offer special thanks to one credit dealer and two journalists, without whose refereeing skills it would’ve remained a mystifying case of underwater rugby without the ball.